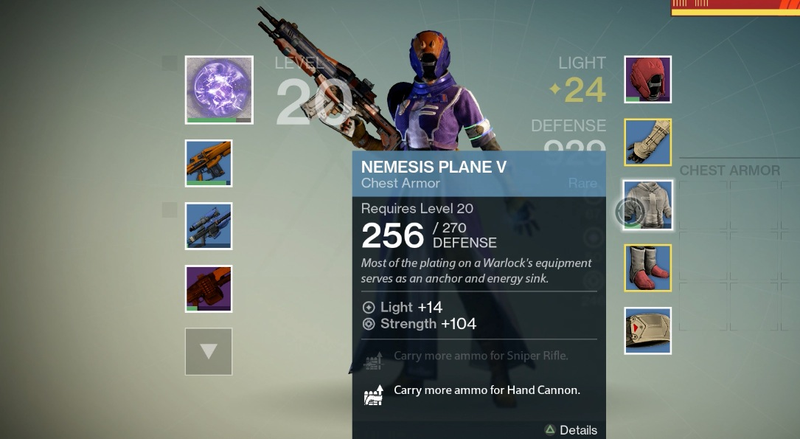 Destiny caps your character's progress at level 20. But if you've been playing, you've doubtless seen people with those yellow numbers by their name, showing levels of 24, 25 and above. How did they do that? I've seen plenty of people asking about the Land Beyond The Cap, so I thought I'd quickly explain how it works. Worth noting: Some of the higher-level strikes require levels well beyond 20, and the first big raid, which launches tomorrow, comes in at a whopping suggested level 26. Each time you get a blue, purple or yellow piece of armor, it'll almost certainly have a light value attached to it. Equip it, and you'll see your now-yellow progress bar climb a little bit. De-equip the armor, and you'll drop back down. You also get yellow XP from upgrading your light-enhanced armor, so it's possible to climb a level without even getting any new gear. You can find good loot engrams just about anywhere—if you want, you can go spend hours farming engrams by killing regular enemies in various places in the open world, or just go on missions and strikes with your friends. I got a purple engram that gave me a rad legendary helmet while re-playing the level 8 Russia strike mission. Your class vanguard, faction leader (if you've joined a faction) or crucible handler in town all have solid, rotating collections of legendary gear on sale, and all of that armor comes with a sizable light allocation. You can't just buy legendary gear for ordinary currency—instead, you'll need to get enough crucible/vanguard marks and get to a high enough crucible/vanguard rank. Each item has a certain value in marks attached to it, and will only be sold to you once you've reached a certain rank. You can gain reputation points (which help you raise your rank) and marks (which act as currency) for your faction or vanguard either by playing in the crucible, undertaking bounties, or doing crucible and strike playlists. You can see how your progress toward a new rank is going by the circle on the side in each vendor's window. Rewards for various events and playlists are shown under each event in the map screen. Bear in mind that you can only get 100 vanguard and crucible marks each per week, so you can't farm them endlessly. You also get light points off of the exotic gear you can buy on weekends from Xur, the vendor who trades strange coins for extremely rare gear. It's worth mentioning that this is all fairly slow going - I've played a lot (30+ hours) but have gotten a legendary heavy machine gun and helmet purely through drops while either farming or playing regular strikes, and haven't been able to afford to buy any legendary gear yet. Last little bit of advice: Keep doing bounties! We included bounties in our tips post for beginners, but bounties don't just give you XP, they also give you crucible and vanguard reputation points. Keep checking in with good ol' Xander to see what's what, and pick bounties according to whatever activities you're going to be doing. Every little bit helps get closer to that sweet pair of pants you had your eye on. If you're serious about getting your vanguard or crucible reputation higher, do every single daily bounty. Once I've maxed out all my vanguard bounties for the day, if I only need a few hundred more rep points to get to a new level, I'll farm these specific patrol missions by going to Mars, checking to see if any are available. If they are, I'll do them. If not, I'll warp back to space, then return, until one is. These are definitely always worth doing: To put things in perspective, you get the same amount of reputation points for doing an entire level 24 strike on the strike playlist. If you want to accumulate a lot of vanguard marks, one easy way is by doing a lot of public events. Provided you get a gold rating, you'll get four marks per event, and they add up pretty quickly. You can find complete public event schedules at this incredibly helpful website. This excellent post by redditor mykkenny provides an incredibly thorough breakdown of the ins and outs of life post-level-2o, how to get the best gear fastest, and how best to spend endgame currency. Hopefully that all helps you get your guardian on her or his way into the Land Beyond The Cap. If you have any questions or tips of your own, I hope you'll share them below.